Talk about 1950s American Drive-In restaurants or American Diners with many readers of P&KG and it is a fair bet that the movie American Graffiti will be mentioned quite soon in the conversation. For lots of readers who live outside the USA, what they saw in this movie may be their first or best-known example of what these drive-in diners are all about. The plot of the film centres on Mels Drive-In, which is the starting point for various adventures of a group of American teenagers starring in the film. In this feature article we explore two of the small chain of Mels Drive-Ins now thriving today. We compare them with the one in American Graffiti and we look into the history behind them. Note that in the original neon signage it is Mels, and not Mel’s, even though it originally belonged to a Mel and said Mel’s Drive-In Restaurant on the original painted sign. Note also that the new generation of Mels Drive-Ins no longer bring the food on trays to your car parked alongside, and have become straight Diners!! But they are not to be confused with Mel’s Diners which belong to other traders. Got that?! When the movie American Graffiti was filmed in 1972, the film-maker, George Lucas, used the Mels at its original location at 140 South Van Ness, San Francisco, as the colourful backdrop in and around which much of the action in the movie took place. It looked fabulous with its space age, curved frontage, neon strip lighting and with the late 1950s cars nosed into the drive-in with their rocket-like tailfins sticking out. According to some stories, the building was already scheduled for demolition at that time, and when the movie opened in theatres in 1973 the bull-dozers had already moved in and reduced the old drive-in to rubble! In fact it appears this Mels was actually demolished in 1976. When George made the movie he certainly knew he was recording a slice of history and life-style that was fast becoming a thing of the past. But what no-one banked on was the level of nostalgia and the new interest that this little low-budget movie would generate around the world in the years and then decades to come. According to Mels website and information in the diners today, it all started back in 1947 when owners Mel Weiss and Harold Dobbs assembled a staff of fourteen female car-hops to serve food to passing motorists seated in their cars at the first Mels Drive-In. Over the next twenty years Mels grew into a chain of eleven locations in California. The full story is given in detail, with some wonderful vintage photos, under “The true story of Mels Drive-in” at DeepRootsMag.org. At its peak in 1954 the Mels franchise was making $4 million per year and serving an estimated 15,000-20,000 burgers a day, as well as many other meals. The building at the original location could cope with 110 cars and 70 people eating indoors. But the car-hop idea, and the Mels chain in general, suffered from competition with the bigger and newer fast-food organisations who did not employ car-hops and became ever-streamlined and less diverse in the service they offered. Mels had eventually ceased trading by the mid-1970s. In the 1980s Mel’s son Steven, who had worked in the original Mels, decided to re-open the Mels Drive-In business to carry on his father’s dream for new generations. He restored some of the Mels locations so that they looked again like Googie 1950s diners, with the neon signs and juke-boxes. He hung some of the classic black & white photos of Mels in the 1940s and 1950s on the walls for customers to see the history and get nostalgic! But Steven also made sure to add vegetarian and other healthy menu options, such as their delicious avocado and tomato sandwiches with multi-grain bread, to please customers of the current era. He has also installed wifi access. So when you go to a Mels Drive-In today you can have the best of both worlds!! Here we visit Mels Drive-In in Sherman Oaks, near Los Angeles, California, with Milkshake Mademoiselle and 1950s Pin-up Girl Nena Moreno. This Mels is at 14846 Ventura Boulevard in Sherman Oaks. It serves breakfast, lunch and dinner, with what they describe as traditional American cuisine, including takeout service, vegetarian and gluten-free options. Nena and I started with traditional milkshakes, a strawberry one for Nena and a pineapple one for me. I followed up with a regular cheeseburger while Nena had cheesy fries. This was late one evening. On another occasion Nena and I arranged to meet up there one afternoon. I was feeling hungry and had eaten an excellent turkey dinner with cranberry sauce and gravy and lots of vegetables, with a pineapple milkshake, before Nena had even arrived! I mention all this to make the point that most of the original diners did not just serve burgers, milkshakes and sodas, unlike many of the newly created 1950s-themed diners. The original diners served a wide range of meals. This was important because for many working people they were regular eating places for lunch, in the days of proper lunch breaks and hot meals at lunch-time. I am glad to see that Mels is still doing this. Mels also offer an extensive breakfast menu, including freshly squeezed orange juice and grapefruit juice. How about their “Breakfast Slider” which is New York-style pastrami, jalapeno and jack cheese scrambled into an egg and served on a briache bun! They have farm-fresh organic eggs and provide a three-egg vegetarian omelette with broccoli, mushrooms, yellow squash and red and green peppers. Or how about their “Elvis Scramble” which is chorizo, green chili peppers and Monterey jack cheese scrambled with three large eggs? The breakfast menu continues with burritos, other tortillas and pancakes, and there are side-orders such as hash browns, tomato slices and turkey sausages. For main meals there are steaks, fried chicken and corned beef hash and what about these desserts: hot apple pie with cinnamon sauce, Marge’s cherry pie, home-made chocolate fudge-cake and Mels double cream cheesecake with strawberry topping! In terms of comparison with the Mels in the movie, you can see that the one at Sherman Oaks is of quite a different design, though no less eye-catching. It certainly has plenty of its own free parking around it so you can pull up in your hot-rod or Caddy and run inside easily. It even has a juke-box, with tableside control boxes for making your selections, and there was plenty of music available from the 1950s, and also the 1960s, 1970s and later. Plus there were lots of old photos and memorabilia to look at. I enjoyed the ambience of the place both while I was waiting for Nena as well as during our meals together and the staff were certainly very friendly and helpful. I certainly recommend the place. 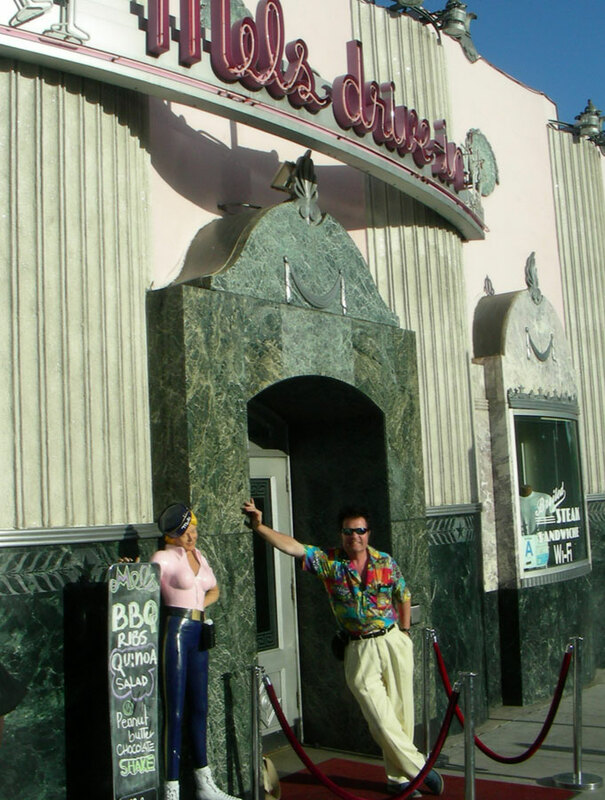 I also made the opportunity to check out the Mels in Hollywood. This time I went with my pin-up friend Lillian Raven. Once again, the building, at 1660 North Highland, Hollywood, 90028 is quite different, both from the Mels in American Graffiti, and in Sherman Oaks. This one is in quite a tall, impressive-looking stone building, with a grand entrance. Inside, our photos show that it looks quite a lot like the Mel’s at Sherman Oaks, though it is more colourful with the green tables and red details more obvious, instead of the acres of beige at Sherman Oaks. Again there are lots of old photos and memorabilia to check out. It is in a much more bustling location, and obviously caters to a much higher volume of tourists who all come to see Hollywood. Parking is charged by the hour and shared with other nearby businesses, with a parking attendant on duty. Lilly and I went in for a meal during mid-afternoon and had such fun chatting over the meal and drinks and listening to the music that we didn’t emerge until just over three hours later, by which time it was dark. This had the advantage that we could then enjoy the place all lit up, including the tall, free-standing illuminated sign by the road. It also had the disadvantage of a fairly hefty charge of ten bucks for the parking! 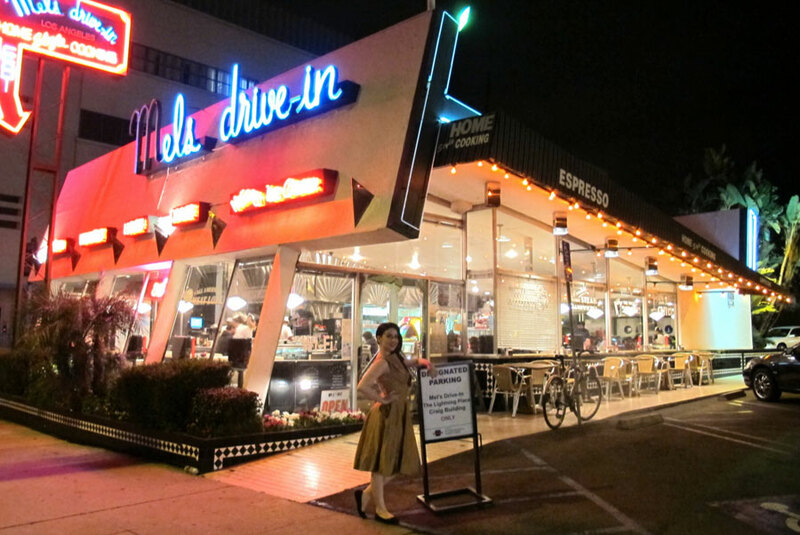 There’s also a Mels Drive-In in West Hollywood which looks a lot like the one at Sherman Oaks and is open 24hrs, plus others for which there are details on the web. And as this is P&KG mag and we are big into signs, sign-writing and such, just a quick word about seeing the iconic Hollywood sign which is mounted up on the southern slope of Mount Lee overlooking Hollywood. It’s quite a hike, though you can actually see the sign in the distance by driving up various roads, including Canyon Lake Drive, which Lilly and I did. The easiest and best view is from the Hollywood and Highland Centre Mall. There are very precise instructions on how to do this on various websites. Just enter Hollywood Sign directions. Walking up to the sign is actually very pleasant through the groves of trees and bushes which grow on the hills, as Lilly and I discovered, but sturdy footwear is recommended, and you can’t get all that close because the sign is fenced off. I’d like to say a huge thanks to Nena Moreno and Lillian Raven for joining me at these Mels Diners and to everyone at Mels for helping to make our times there so pleasant and memorable.